Gazebos are often detailed structures with a roof that provides shade in a park, yard, or garden. Greeks and Romans built gazebos and pavilions in their outdoor temples, and they offered privacy during the medieval and Renaissance periods. Egyptians built gazebos in their vineyards to create earthly paradises that would follow them to their afterlife. State capitals, parks, and town squares are frequently decorated with beautiful gazebos as resting spots and focal points. Gazebos are wonderful locations for garden weddings. 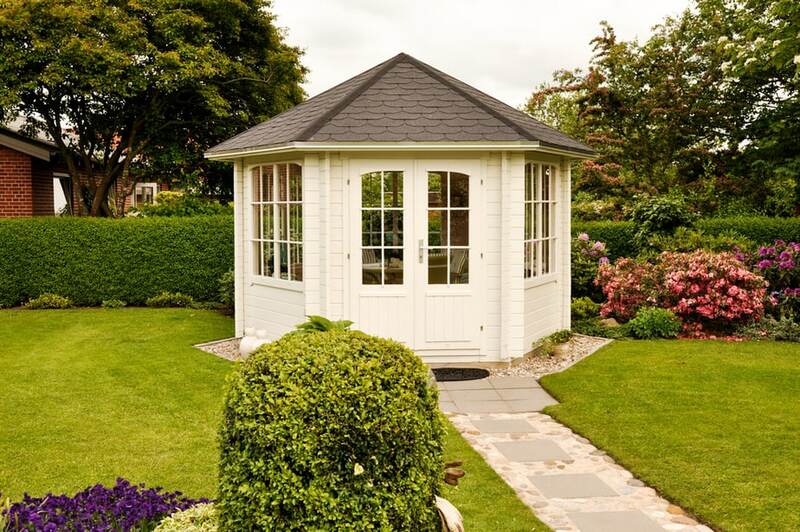 English gardens and large estates usually come equipped with a gazebo in a picturesque setting. Outdoor spaces and sitting areas are a popular feature of modern yard design. Gazebos and outdoor structures can be made with just about any materials and in any design. You can buy gazebo kits and portable canopy gazebos at just about any home and garden store. DIY homeowners can purchase lumber and design and build their own gazebos if they choose to do so. 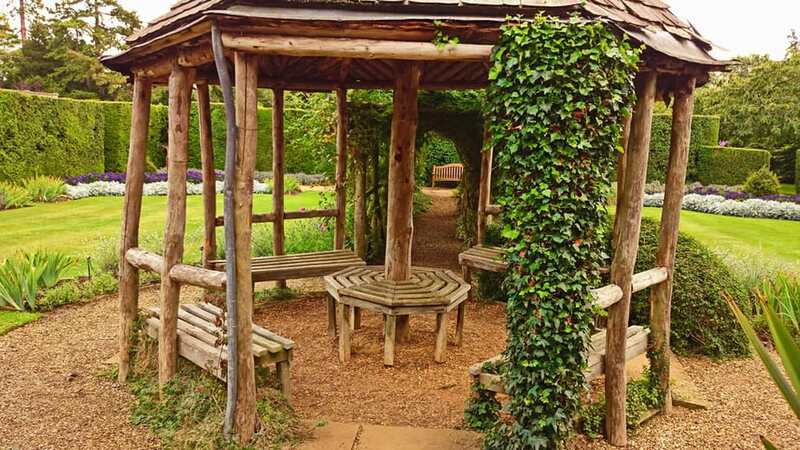 You can create a simple, shaded pavilion structure or a fancy ornate work of art, use traditional materials to create your home gazebo, or get fancy and use eco-friendly materials like reclaimed wood, bamboo, or recycled products. In this article, we’ll be discussing 37 gazebo ideas that will hopefully spark your imagination and help with your gazebo design needs. You can build a gazebo once you have the essentials down. The first thing you’ll need is a level foundation or slab. Then, posts must be anchored to the slab. The frame of a gazebo is created by adding boards to the top of the posts, and finally, railing and balusters are added as finishing details. You can get as fancy or as plain as you want by adding plain or intricate corner brackets for support and visual appeal. 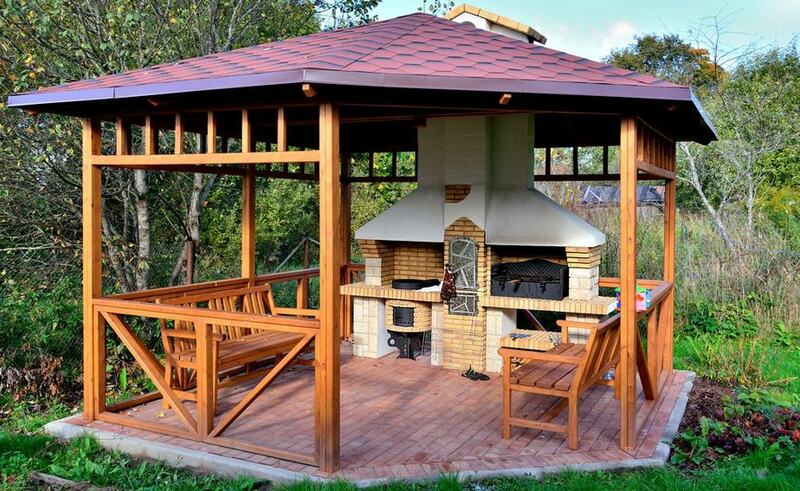 A gazebo roof can be made of shingles, canvas, tin, or really anything you can dream up. However, rafters and fascia are required for most roof structures. Using a kit or hiring a contractor can make this part easier, but there are also free plans online that can help make the job easier if you plan on building a gazebo on your own. However you design and build your gazebo, it will surely be a welcome addition to your home and yard. Here is a beautiful cedar wood gazebo in a city park. It has a stone foundation with a ramp and a wooden shingle roof. It has an ornate hub and finial that looks like a miniature replica of itself. The open entranceway is arched, and the other sections are arched with rails and balusters on the bottom. 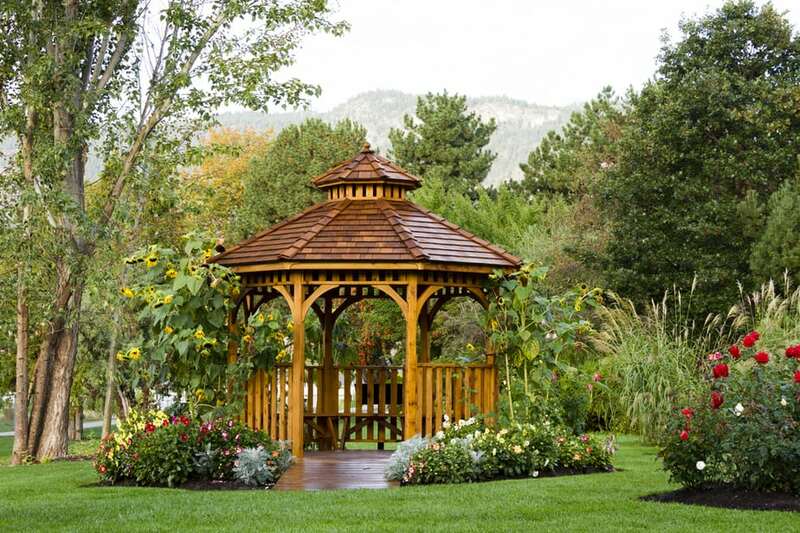 This is a lovely stained cedar gazebo that is sure to catch the attention of any visitor. 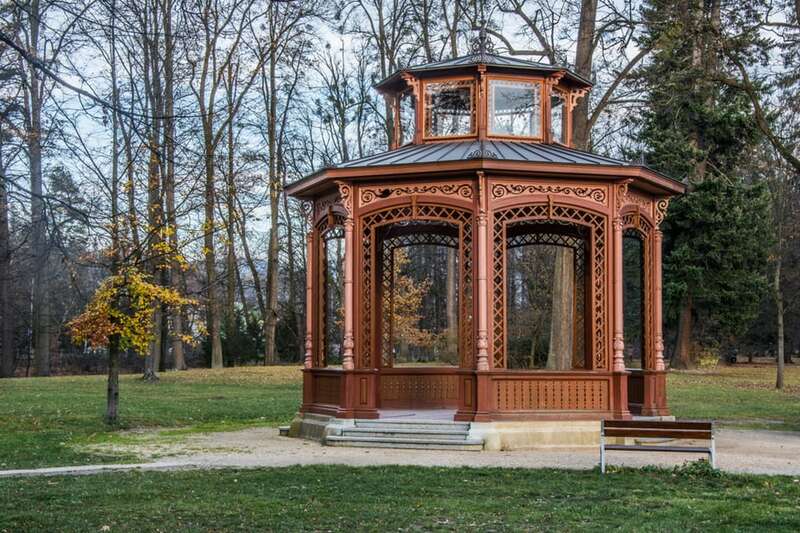 This is another lovely stained wood gazebo in a park-like setting. This one is built on top of brick-like paver stones and isn’t quite as ornate as the first one. The interior of this gazebo may be a bit roomier than the first. 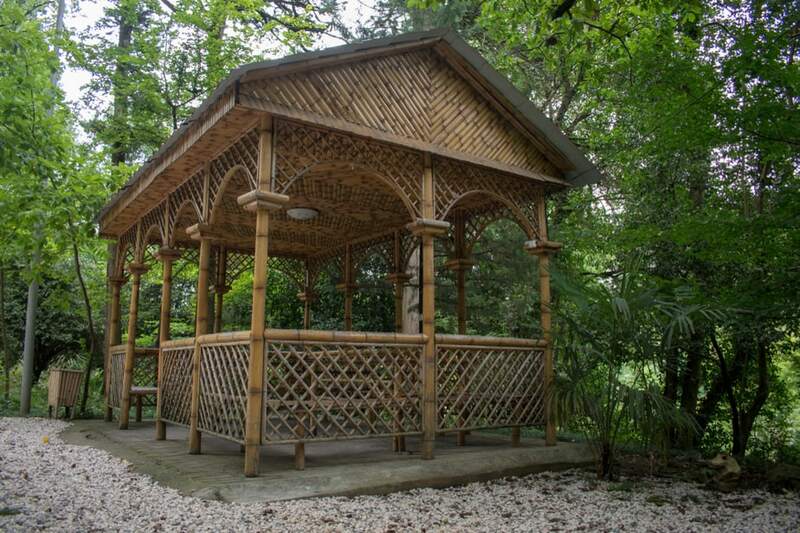 This gorgeous gazebo sits next to a pond in a lovely botanical garden. It’s painted a light gray color with a wooden shingle roof. This is a perfect example of how a hexagonal or octagonal gazebo can really make an area look inviting. This gazebo has a built-in kitchen. 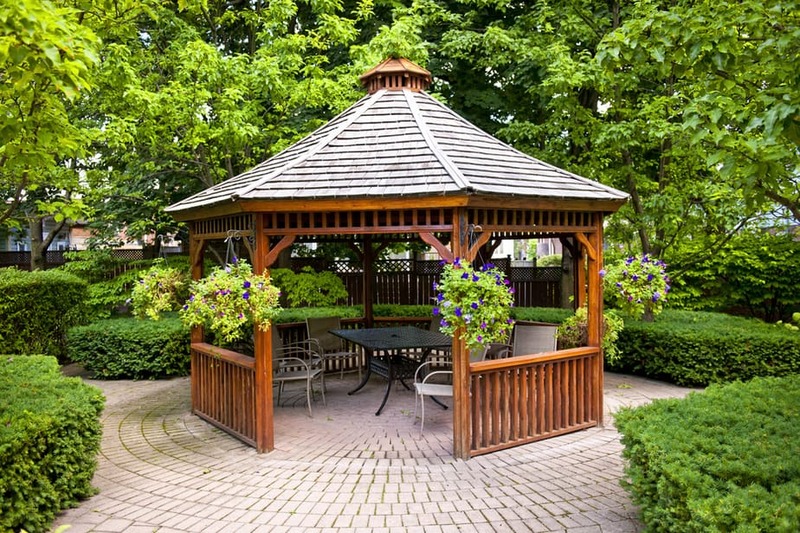 This hexagonal gazebo is made with straight, stained boards and a shingled roof. The foundation is cement and brick. It also has a built-in pizza oven and kitchen, which is great for evening cookouts. There are also benches for sitting in the shade while the oven is doing its job. 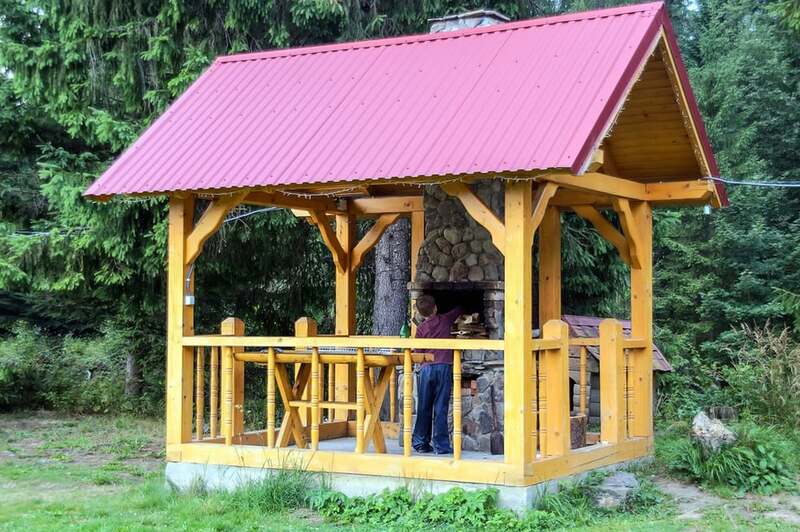 This gazebo is made from natural logs. It has a wooden shingle roof and is a beautifully simple design. The center support post has a bench built around it, and the edges are also decorated with benches with lively green vines climbing up a post. This is a lovely down-to-earth gazebo design. 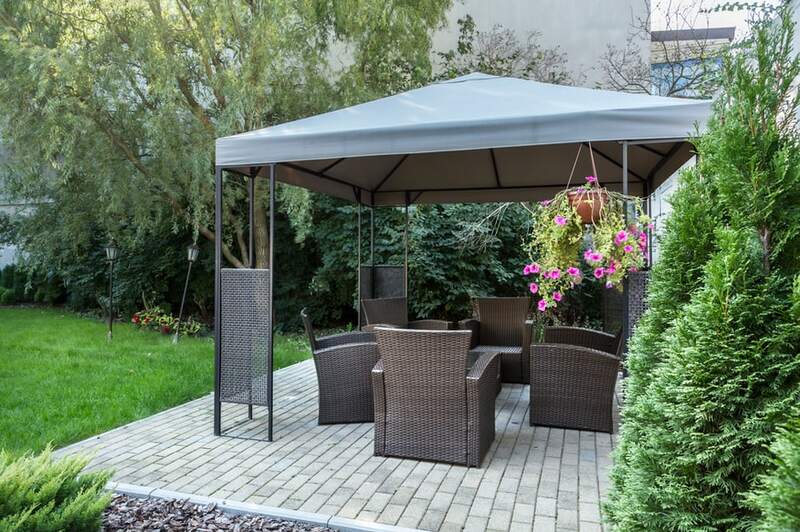 This hexagonal gazebo is made with square posts, with decorative triangular-shaped railing. But what really makes this gazebo stand out is the roof. This gazebo is not only in a garden, but the roof is a grass-covered garden of its own. This is a unique design with a cobblestone floor that you don’t see every day, sure to catch the eyes of your guests. The reign of Queen Victoria began in 1830 and ended in the year 1910. Several revival architectural styles were built during this time. Some of these include Gothic Revival, Italianate, and Queen Anne. In our Victorian Gazebo section, we are including some of these intricate gazebo designs. 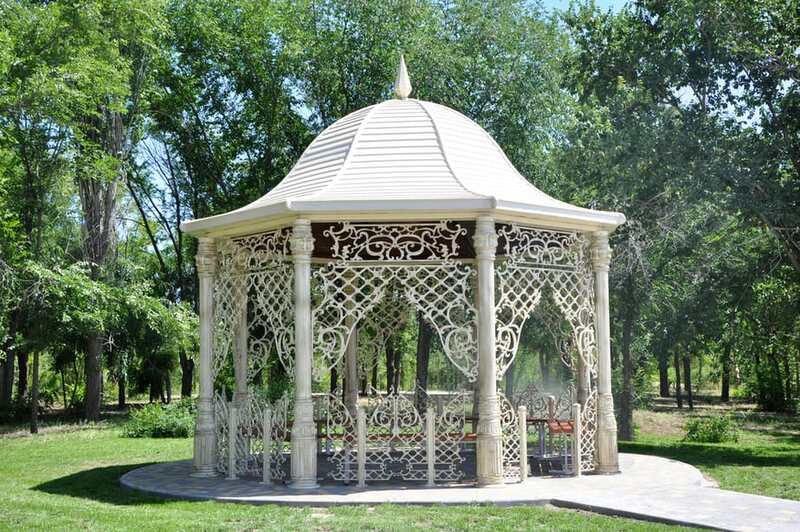 This ornate white gazebo is a perfect example of the Victorian style. It has large shingles on the roof and is topped off with a spire. It is larger than most gazebos and extremely ornate. It has windows and intricate design details from the unusual shape to the large stone foundation. This is another example of a Victorian style gazebo in all wood, aside from the tin roof. The details of the design are very intricate, and the entire structure sits on a raised foundation with steps. This large observation deck is made from large, white pillars. It sits on a low hill and has steps leading up to it. Even though it looks like a Greek structure this one is actually in Kislovodsk, Russia. This white Victorian gazebo has a green roof and matching finial. It’s octagonal-shaped, and the top of the posts are decorated with a fancy squared design. Steps lead up to the interior, and there are benches by the side rails for relaxing in the shade. Here is another octagon-shaped gazebo. The posts are actually white, while the pillars, rails, and baluster are a fancy cut-wood design. The white gazebo with green trim stands out in the snow. Green garland with red bows is also wrapped around the posts to celebrate the wintry holidays. Here is a wonderful example of a gazebo enclosed in glass windows and glass double doors. It has a shingled roof and brick flooring. This gazebo will keep you out of the elements, and the glass in the windows and doors can even serve as a type of greenhouse. Here is another example of an enclosed gazebo. This one is a beautiful white with a dark, shingled roof. It also has glass double doors and glass windows. There is a stone pathway leading up to it, and it sits on a stone foundation. 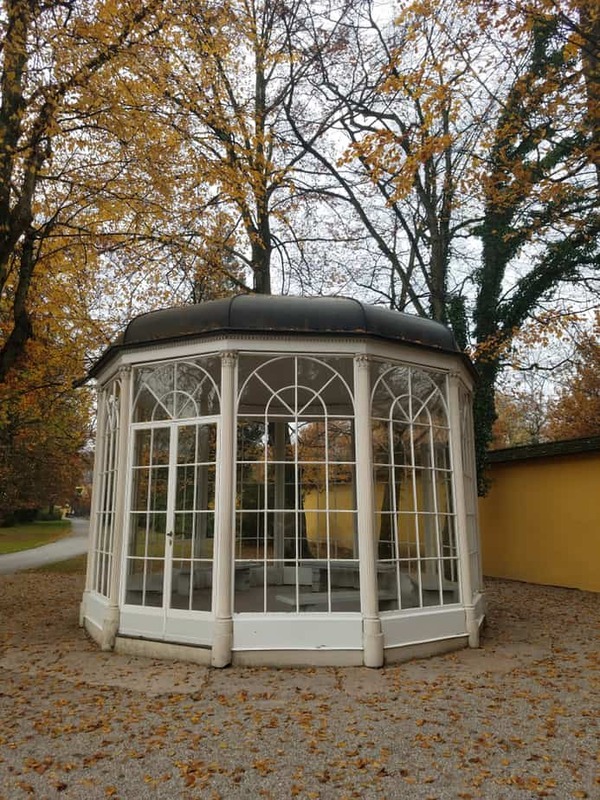 This fancy gazebo was actually used in the movie, “The Sound of Music.” It’s made from beautiful white pillars enclosed with fancy arched glass windows. The dark, domed roof sets off the look in this country garden. Here is a fancy ornate domed gazebo. The white pillars are set off with a beautiful Victorian design, and the white domed roof has a teardrop spire. This gazebo would make a wonderful focal point in a park or botanical garden. This stone-decorated dome is a historic gazebo in the Conception Garden in Malaga, Spain. This garden and house were built in 1855, and this beautiful gazebo is its symbol. This garden features a black bamboo forest, amazing views of the sea, a wisteria arbor with many more natural wonders. This gazebo resembles a medieval castle. Looking at it from a bird’s eye view, you would also see the dome that serves as its roof. The arched door and windows remind us of medieval castles and adventures of the past. This domed gazebo maintains a sophisticated look with white pillars and white railing. It sits on top of a hill and is a beautiful reminder of creativity and architectural design. 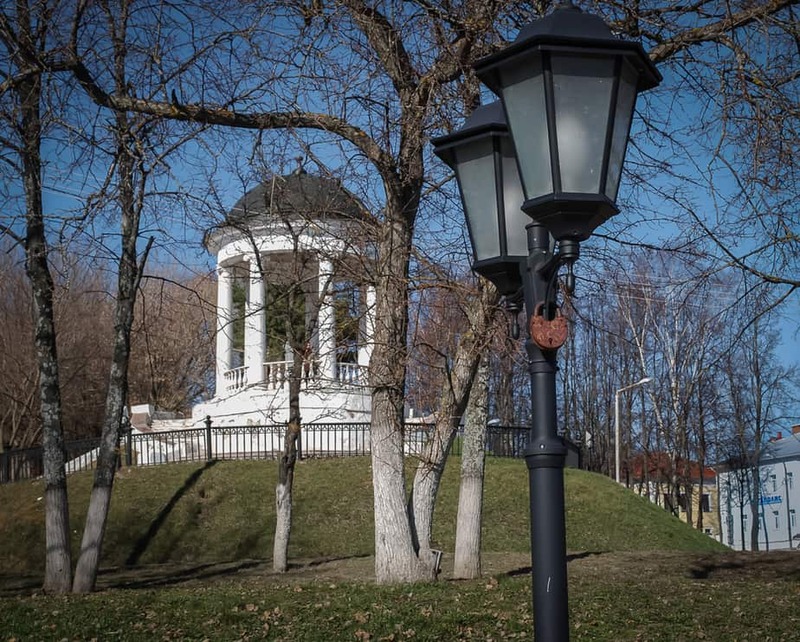 This gazebo is in Russia, but it looks like something that would be found at Jefferson’s Monticello. 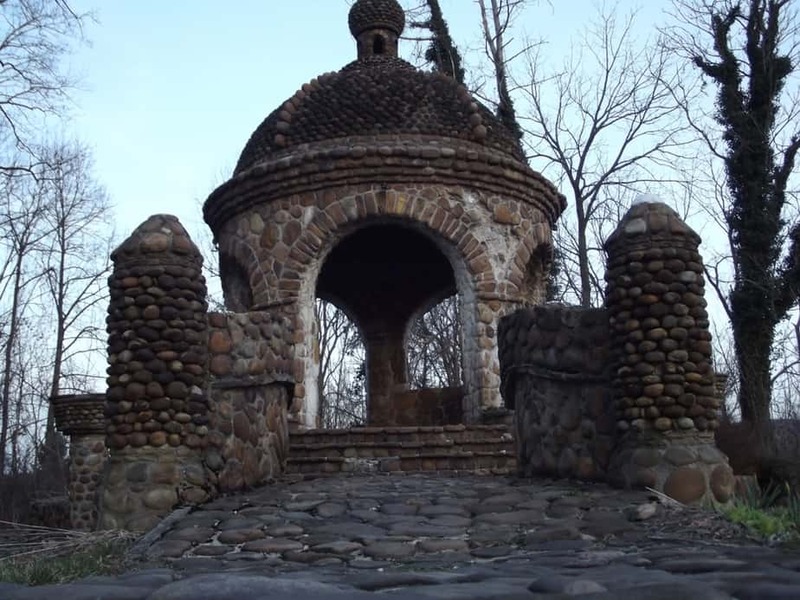 This old Gothic looking stone gazebo has a domed roof and stone steps and walls. This gazebo would create the perfect fantasy getaway in any garden, park, or forest. Versions of this unique design could be adapted for a modern backyard gazebo design. This iron dome has intricate design work and a stone floor. It’s offset by roses, and the area is large enough for wicker furniture. This is a unique design that really makes this garden hideaway stand out. These large, majestic white pillars sit atop a raised stone foundation. The roof is a dome made out of curved iron rods. This structure doesn’t offer any protection from the elements, but it is a beautiful focal point that would make any garden look sophisticated. Here is a triangular-shaped pavilion with a cute, red-colored tin roof. This wooden pavilion sits on a cement foundation and has a table and picnic area inside. This is the perfect way to enjoy the outdoors while keeping out of the sun. Here is another triangular-shaped gazebo. This one is actually made of eco-friendly bamboo. It has a gabled roof and is roomy enough for several tables and chairs. The structure provides shade in a natural forest or tropical picnic area. This eye-catching structure is made out of logs and sits next to a lovely Lake. This is the perfect structure to keep a bride and groom happy during an outside wedding. It has built-in log benches and a built-in log tabletop to keep the wedding party comfortable while enjoying the outdoors. Another great place for a wedding is in this lovely oval gazebo that overlooks the lake. This is the perfect backdrop for a wedding ceremony that you won’t soon forget. This natural wood structure has a wood shingled roof and a charming oblong design. Nothing is more romantic than a beach wedding with a sunset for the backdrop. This gazebo protects the bride and groom from the elements and provides spectacular views. This fancy white gazebo would also be a stunning daylight wedding venue. Gazebos provide focal points and shade. Here is an example of a backyard gazebo that creates a wonderful sitting area. This gazebo is built with large posts, arched support braces, and a solid roof. This is a great backyard option. Here is a lovely rectangular shaped gazebo that’s painted white. The longer shape provides more room for seating, and the solid, shingled roof protects daylight visitors from the sun. The dazzling string lights provide the perfect ambiance for nighttime use. This unique gazebo is made out of iron and has a solid, square roof. It sits on a brick foundation with steps leading up to it and is surrounded by flowers, shrubs, and a giant oak tree. This is the perfect decoration for this unique park setting. This gazebo is right on the lake. This is the perfect structure to provide seating and protection from the glare of the sun. This would be a picturesque location for a picnic or outdoor gathering. This is a simple, four-post pavilion with a shingled roof. Canopy gazebos are a wonderful way to have all the beauty and utility of a gazebo without all of the construction time and costs. This gazebo sits on a beach and has a canvas roof and sides for the ultimate in sun protection. 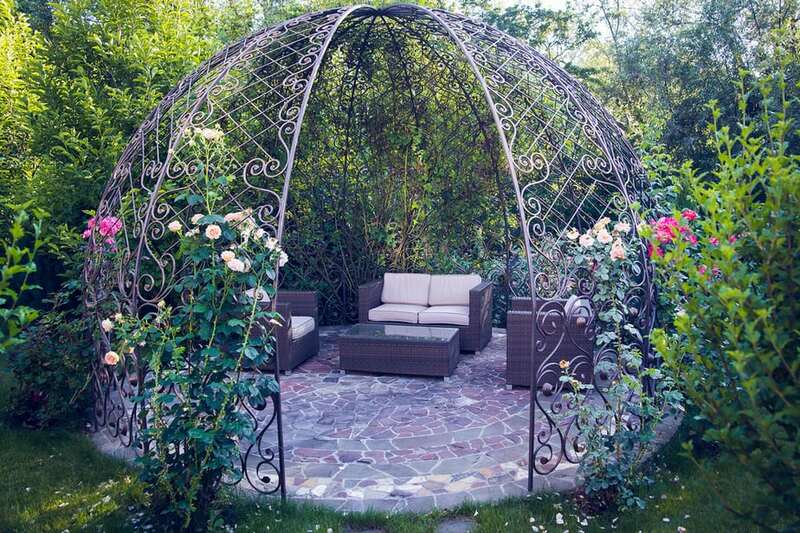 This gazebo provides the perfect shady spot for any backyard. All you need for a gazebo like this is a level surface and a gazebo that you can purchase at any home and garden store. This one sits on a brick patio and has a metal frame with a canvas roof. Here is an example of a tropical gazebo on a white sand beach in the Dominican Republic. It sits above the water at the end of a wooden walkway. Shade is provided by the tropical thatch roof. 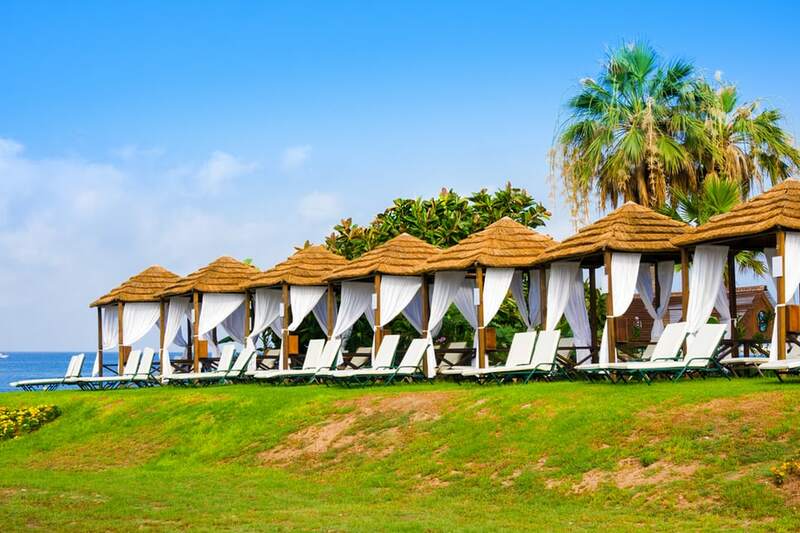 Here are several gazebos on a Mediterranean beach. After tanning, get some relief from the sun with these tropical wonders. You can also create privacy by closing the canvas curtained walls. This fancy gazebo is the perfect indoor/outdoor sitting area. 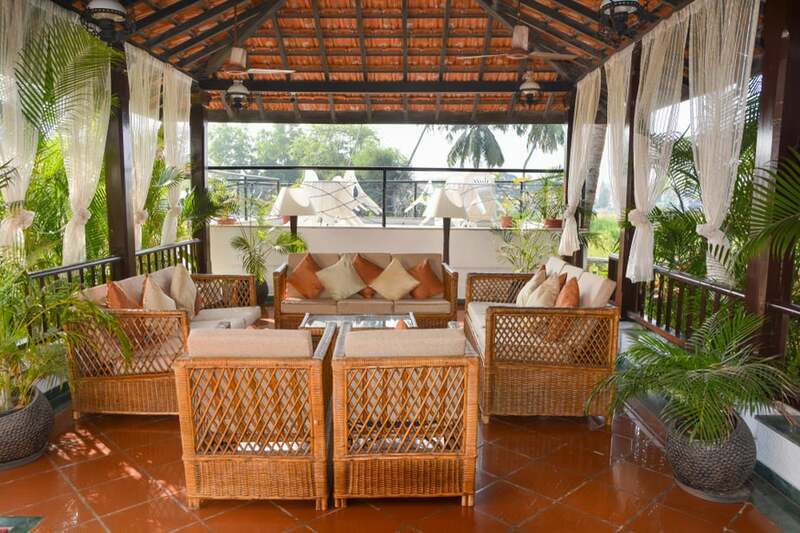 Comfortable wicker furniture is covered by this roofed structure, and linen curtains provide the perfect ambiance in this tropical locale. This domed gazebo is adorned in red lights. This makes the perfect backdrop behind this snowy lake on a winter’s night. No matter the season or occasion, rope lights can decorate any structure and make it look amazing. Here is a lovely Victorian gazebo lit up at night. 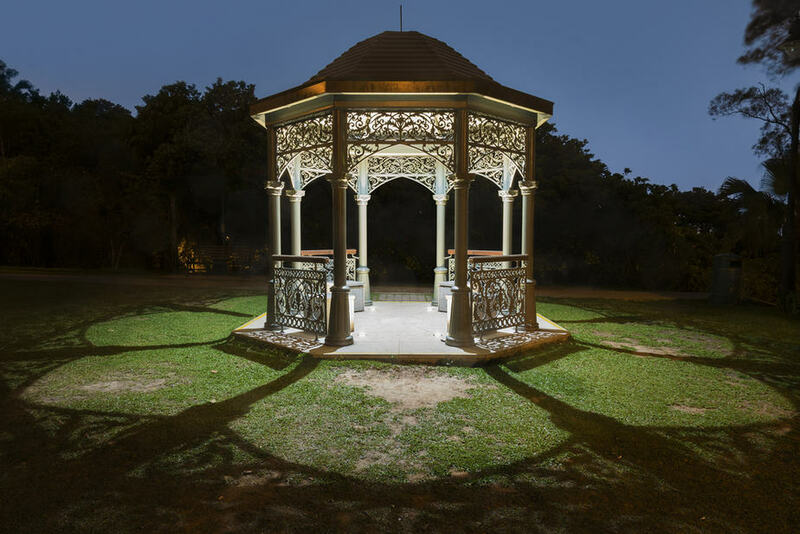 This gazebo creates a stunning focal point during the day and shines even brighter at night. Lighting is a lovely addition to any outdoor structure, pergola or gazebo. We hope these gazebo ideas were useful for designing your home or park gazebo. Gazebos are perfect places for weddings, picnics, or just resting in the shade. 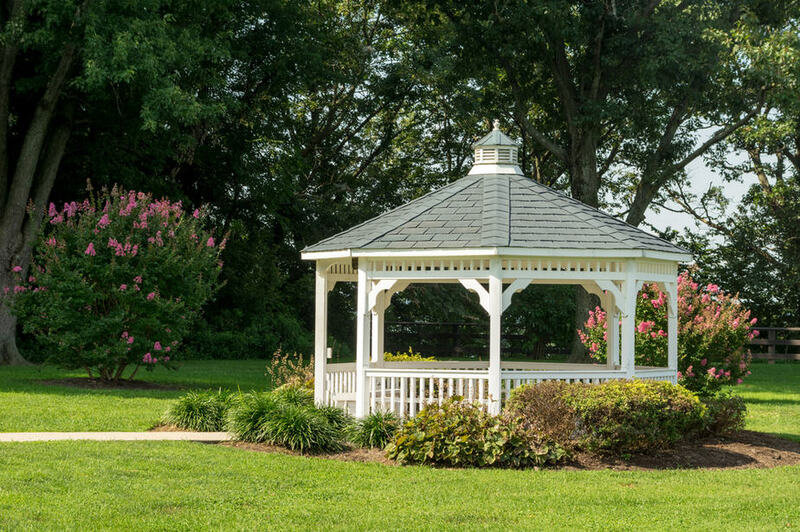 A plain wood gazebo or a fancy white Victorian gazebo are both welcome additions to any outdoor space. You can find gazebos all over the world. They are very popular in botanical gardens and historical settings. A gazebo can be made in any shape or material. Traditional shapes include six-sided, eight-sided, square, triangular, and domes. Gazebos can also serve as double-duty functions. A glass gazebo or windowed gazebo can be used as a greenhouse. A perfect example of this is the greenhouse gazebo in the Glasgow Botanic Garden in Scotland. This garden has been delighting visitors for 200 years. Another amazing gazebo is the white pillar and cast iron domed gazebo in the Sonnenberg Gardens in New York. This is a 50-acre estate with an interesting history. It consists of the gardens and a mansion and is a perfect example of the Victorian era and architecture. This was the Victorian summer home of Frederick Ferris and Mary Clark Thompson. They named it Sonnenberg which means “Sunny Hill” in German. It’s filled with period architecture and features a Japanese tea garden and complex greenhouses, as well. In 1923, the government purchased this complex and made it a VA hospital. Upkeep was neglected, and it fell into disrepair over the years. In 1972, President Nixon signed a bill that transferred ownership to the Sonnenberg Gardens non-profit and restoration began. It’s now the splendor that it once was thanks to concerned citizens and a US President. Gazebos can also be used as an extension of your outdoor living space or as an addition for your patio ideas. Whether you’re looking for something to dress up your home or another outdoor space a gazebo may just be the answer.